Are you looking for a little bit of love, because these beauties are ready to deliver. 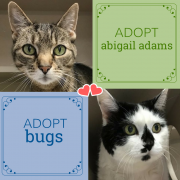 Meet Abigail Adams and Bugs. This pair of senior sweeties are looking for a new home to call their own. Abigail is a petite little girl who is full of love, affection, and curiosity. Her sweet sis’, Bugs was a bit shy, but is now letting her loving, playful side show. The girls are both 13 years-young and came to DAWS when their owner passed away. While they could be adopted separately, we are hoping to find them a family who is willing to open up their home to both of them. They’ve been together for so long, and we want them to be able to spend the rest of their golden years together. Would you open your hearts to Abigail and Bugs?